We're all trying to come to terms with the fact Ford Crown Victorias won't be sneaking up behind us on the highway. And by coming to terms, I mean slowing down just about anytime you see something in the shape of a Crown Vic. Some day, they're all going to be gone and we're going to be left guessing if our state's patrol is going to stop us in a Charger, Caprice, Taurus, etc. Rough. The Panther platform could've been phased out a decade ago had a former Ford subsidiary had its way. Back in 1999, the Dearborn giant had just swallowed up Volvo, which made police versions of its cars for countries all over the world. Now they wanted a slice of the American market. And what better than import-loving California. Back in April 1999, the Los Angeles Times wrote about the CHP putting some Volvo S70s painted in black and white and outfitted with the necessary items to take part in a pursuiting, say, a Ford Bronco. On paper, these old Volvos looked good against the beloved Crown Vics. Whereas the 4.6-liter V8 in the Ford made about 215 horsepower, trying to motivate something that weighs more than 4,000 lbs., the Volvo had a 2.3-liter boosted five-cylinder with 236 horsepower. And it was about 700 lbs. lighter than the opposition. Anyone who drove a V70R from the late-'90s knows it's surprisingly fast. OK, so a Volvo doesn't have quite the same intimidation factor a big, rear-drive American sedan has when it pulls up behind you, but when it comes to actually catching up to chase suspects it definitely out-handles. And the cops who tested it in California's mountains, deserts and potholed freeways said "it runs strong, stops straight and has excellent handling." Any teen who's hooned a turbo Volvo as their first car could've told you that. It was not to be, however, and it wasn't necessarily because of the "Buy American" political flack the CHP was getting (ignoring the fact the Crown Vic was made in Canada). Volvo's relationship with the CHP soured a year later when the S70 went out of production and the Swedes wanted to sell them the V70 in a patrol uniform. And for some reason, that didn't sit well with Officers Ponch and Larry Wilcox. Officers saw wagons as "soccer mom's car for hauling kids around," a Volvo rep said in 2000. Funny, because this year, now that the Panther has been put down for good, the CHP wants to outfit officers with Ford Explorers. Because those don't scream "soccer mom" now, do they? It's a case of what could have been if California adopted a Volvo as their state patrol car and if other states would've followed suit. 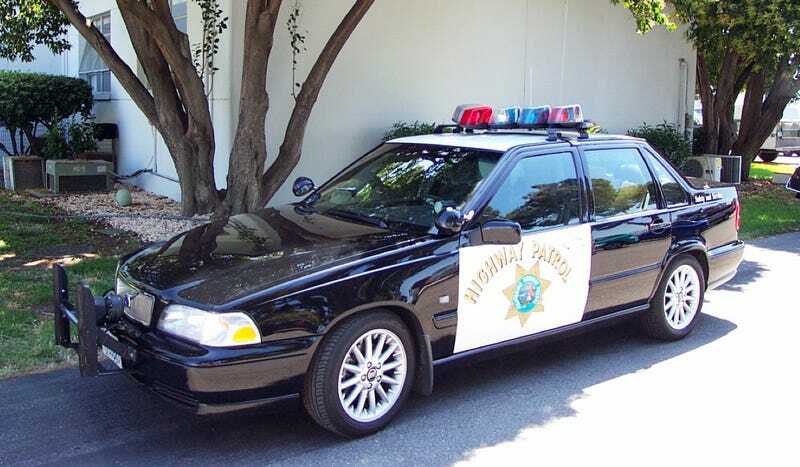 But it's interesting to note the origins of the Explorer police interceptor come from the V70 the CHP turned down a decade before. Bet it still runs strong and stops straight. What Euro police cars would you like to see in the U.S.?